Sometimes one’s creativity goes up when one’s options go down…………..I think that is what happened with this entry to Pretty Cute Stamps Monthly Challenge. The theme was Thank You but I had recently used the only Pretty Cute Stamp Set I had with that sentiment on it, on a previous challenge. So what to do?????????? I took the small liberty of adding a Memory Box die cut as it was the perfect size for what I wanted to do, but the main focus is Pretty Cute Stamps’ Moody Crabs. I just think it is so dang cute! 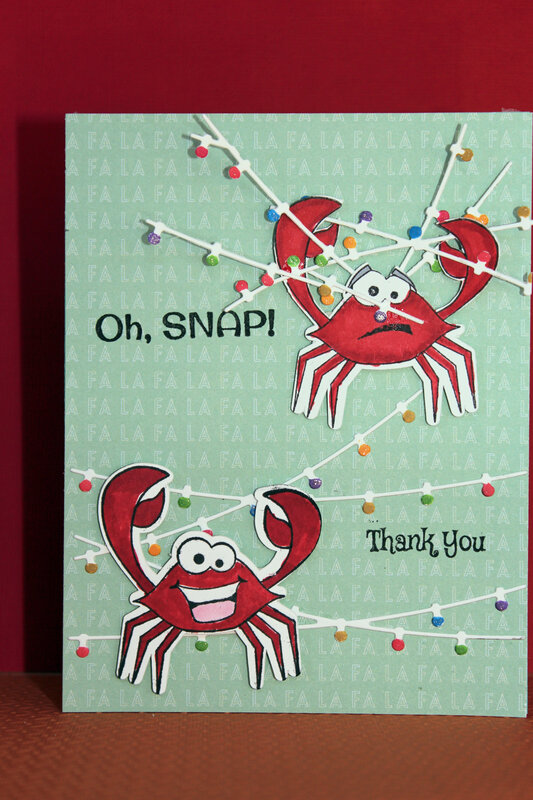 Supplies: Pretty Cute Stamps Moody Crabs and Leapin Lizards stamp sets, Memory Box String of Lights die, American Crafts Good Tidings 6X6 paper pad, Wink of Stella glitter pens, Zig 2 way glue, Hero Arts Tide Pool card base and Scor tape. Posted on November 6, 2015, in Card Samples, Challenge Entries, Debbie's Challenge Entries, Oscar's (Deb's) Card Samples and tagged Copics, Pretty Cute Stamps. Bookmark the permalink. 12 Comments. Very cute, love the layout and colors! Thanks for joining us over at The Pretty Cute Stamps Challenge! This is super cute!! I love the way you combined the stamps and used the dies!! Thanks so much for joining us for the Pretty Cute Stamps challenge this month!! What a fun card! thanks for playing along at Pretty Cute Stamps! This is really cute! Perfect sentiment! Thanks for joining us at Pretty Cute Stamps! What a creative card! Thanks for playing along with the PCS Challenge! Super cute! Thanks for playing along with us! I LOVE this! So super cute! Thanks for joining us at PCS challenge!